Sammy (who prefers the name "Sammy Whammy") is a Greenwing Macaw who came to our home as a mistreated parrot. We were unable to handle him at all at first because he would bite and really hurt someone bad! After lots of love, attention and patience (and a few really bad bites) he eventually became a cuddly and loving member of our flock. He's full of energy, a real acrobat and his vocabulary is outstanding! One of the cutest things he'll do is call out to Baby (our Moluccan Cockatoo) quietly as they go night-night and blow her a kiss. If you would like to learn more about how to care for parrots, or would just like to see some more great photos of Sammy and Baby you can visit them on their website. Sammy is very territorial when company is around. He will perch on someone's arm and check them out, but is always on the guard. It's a trust issue. He's very affectionate to us because he trusts us. He's not a big fan of scritches and still won't let anyone hold his feet. But he doesn't bite out of fear anymore. It took at least a year for him to stop biting wildly like that. And it took months just to get him to perch on us. It would be interesting for his former owners to see him now. I don't think they could ever believe he is the same bird! The most impressive thing about Sammy has got to be his vocabulary. And he seems to only pick up what he wants to. It's so extensive we could fill up the page with examples. Probably 70-80 words/phrases. Maybe more. The best thing about it is that he uses his words at appropriate times. He'll also set aside part of his day to go over his vocabulary and refine things. One of the cutest things he'll say is "Gimme kisses buddy!" and then he'll blow a kiss. When he thinks someone shouldn't be doing something he'll tell you to "stop it!" or "don't do that!" If he touches food that is too warm he'll say "hot!" When he wants a wash he'll say "shower." When he's thirsty he says "water." And although we've always called food 'yummies' in our birdie household, Sammy prefers to call food "crackers." Sammy's version of his nickname 'Sammy Whammy' is "Samiami!" although he's said it properly other times. The most difficult phrase he learned is "very pretty", but he's really got it down now. When we pet Baby and spread her wings out, Sammy will say "veeeerry preeetty." We're working on teaching him 'beautiful' and it probably won't take too long. 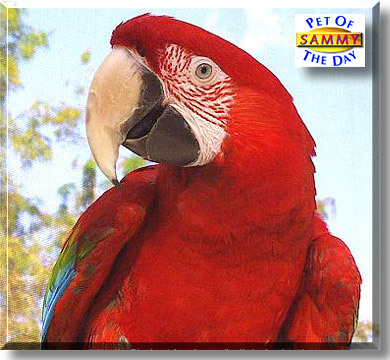 Sammy's a very special parrot who is full of personality and vitality. He came from being a mistreated, a phobic biter who was frighteningly dangerous, to a loving parrot who belongs in our family. He came so close to becoming just another tragic story about a mistreated/misunderstood parrot. Fortunately his story is a happy one!